We’d love your help. Let us know what’s wrong with this preview of A Simple Singing by Leslie Gould. For years Marie Bachmann thought of herself as the "good" daughter. She was the most loving to their mother, the most dedicated to their Amish way of life. But when a Mennonite farmhand, Gordon Martin, shows interest in her she can't help but be flattered--until her mother sends her off to Florida. While there, Marie begins spending time with bad-boy Eli Jacob, the bishop' For years Marie Bachmann thought of herself as the "good" daughter. She was the most loving to their mother, the most dedicated to their Amish way of life. But when a Mennonite farmhand, Gordon Martin, shows interest in her she can't help but be flattered--until her mother sends her off to Florida. While there, Marie begins spending time with bad-boy Eli Jacob, the bishop's son from back home. To ask other readers questions about A Simple Singing, please sign up. Oh, how I enjoyed both of the stories in this book! Leslie Gould is a master at dual timeline stories and each one I read from her is better than the last. This book with its modern day and Civil War-era stories is wonderfully written and if I had to use one word to describe it I would simply say perfect! I really liked the way this book was set up. First, we get to meet Marie, the main character in the modern day story. She is likable and relatable. She is trying to be the perfect Amish daughter Oh, how I enjoyed both of the stories in this book! Leslie Gould is a master at dual timeline stories and each one I read from her is better than the last. This book with its modern day and Civil War-era stories is wonderfully written and if I had to use one word to describe it I would simply say perfect! I really liked the way this book was set up. First, we get to meet Marie, the main character in the modern day story. She is likable and relatable. She is trying to be the perfect Amish daughter but isn't really happy. Then when we have spent enough time with Marie to feel like we know her then we are introduced to Annie, the main character in the Civil War story. Annie is another strong character and I liked her just as much as I did Marie. There are several supporting characters in the book and there wasn't really one I didn't like. They are all well-developed. It was easy to forget they were fictional characters. As much as I liked Marie's story I think Annie's was my favorite. I like reading about the Civil War and I think the author did a fantastic job of bringing it to life. Not since reading Margaret Mitchell's Gone with the Wind or John Jakes' North and South series has an author made me feel as if I was experiencing the war right along with the characters. In fact, Gould's descriptions of Annie's arrival in Gettysburg took my breath away. It was so easy to picture everything she described and to feel the emotions Annie did. I feel like through her words I knew what it was like to be there and see the horrors of the war. It was really interesting to read how the Amish played a part in the Civil War. I highly recommend this book. It's a quick and easy read with two great stories wonderfully tied together. I will advise you to set aside some time to read this one though as once you start reading it's a hard book to put down. Courting or marrying a Mennonite when you are a baptized member of the Amish faith will get you shunned by your Amish family and friends......but Marie is thinking of doing just that. But she has conflicting feelings when a young Amish man. that she is also attracted to. returns from Florida. He is not a baptized member of the Amish church yet and he may be a bit too wild. What will Marie do? Will she follow God's will or decide for herself what God desires for her life. This book is wonderful! Courting or marrying a Mennonite when you are a baptized member of the Amish faith will get you shunned by your Amish family and friends......but Marie is thinking of doing just that. But she has conflicting feelings when a young Amish man. that she is also attracted to. returns from Florida. He is not a baptized member of the Amish church yet and he may be a bit too wild. What will Marie do? Will she follow God's will or decide for herself what God desires for her life. This book is wonderful! It is the second book in the Sisters of Lancaster County series, but it can be read as a standalone. I didn't want to put this book down for a minute and couldn't wait to see what would take place for the beloved characters. I am rating this book 5 stars and highly recommend it to readers. In the past book, we saw what was going on with the farm in Lancaster, and in this book, we learn how the farm stayed in the family. The author also shows u What a great read from beginning to end, the author has us spanning decades, from current to civil war era. Companion stories are beautifully interwoven throughout this very interesting novel. Amish life is portrayed both in Civil War time and modern day, with examples of what is acceptable and not, in both time frames. A bit of Mennonite life is interspersed throughout the stories to give a bit of comparison in traditions in both ways of life. Well developed characterizations and descriptive depictions of the landscape and pictures of the ravages of war are highlights throughout this book. Relationsh Companion stories are beautifully interwoven throughout this very interesting novel. Amish life is portrayed both in Civil War time and modern day, with examples of what is acceptable and not, in both time frames. A bit of Mennonite life is interspersed throughout the stories to give a bit of comparison in traditions in both ways of life. Well developed characterizations and descriptive depictions of the landscape and pictures of the ravages of war are highlights throughout this book. Relationships and fellowship with those unlike ourselves are highlighted through the use of homelessness, slavery and differences in culture, demonstrating selflessness in a world of selfishness. Spiritual growth and maturation are highlights in both the main characters throughout this novel. The Civil War was well researched for this book, as tales of the Battles of Gettysburg are well defined and accurate. I loved this book, and look forward to the next in the series. This author has a talent for bringing to life the miseries we share, and the beauty of redemption. A Simple Singing is the second instalment from The Sisters of Lancaster County series by Leslie Gould. Even though it is book two of the series, I have not read the beginning, A Plain Leaving, and felt this one could be read as a stand alone. I love historical fiction, as well as, Amish Fiction. When the two combine, makes it a great read. I received this book from the publisher, but was not required to write a review. This review A Simple Singing is the second instalment from The Sisters of Lancaster County series by Leslie Gould. Even though it is book two of the series, I have not read the beginning, A Plain Leaving, and felt this one could be read as a stand alone. I love historical fiction, as well as, Amish Fiction. When the two combine, makes it a great read. I loved how Leslie Gould could weave past to present and then eventually tie it in altogether. There are many delightful characters in this book. I do agree with some other reviewers that Marie is kind of hard to warm up to. But, I do like how she is challenged because at first she knew what she wanted out of life. I liked some of the challenges that God sent her way. Kind of like what I'm going through now. I think God has sent me a wake up call. But, gosh did He have to do it the hard way? Ann I loved how Leslie Gould could weave past to present and then eventually tie it in altogether. Annie is a character of the past whom I greatly admired! When it is something that she didn't back down. Before I go on, I wanted to remind y'all that this is a different type of Amish story than we're used to reading. To me, I think it's very exciting because it's different and it shows us that not all Amish are the same in their beliefs. It is mentioned through both books about Rebecca's drowning and how it changed Marie and Jessica's mamm. Tragedy can come unexpectedly and in many different forms. Not just death. I do admire family (except ours) I know that some ppl believe very strongly about family ties and how they always stand by you. Today, I found out differently. No, they don't. The other thing I love about Leslie's writing style is that she uses first person. I loooooooove this. It's my favorite genre. To me, I can connect with the people in the story much better than the other way. The second way she writes I felt like I was in Pinecraft w.ith Aunti Suz and Marie. I felt like I was there with them even tho I just got back from Florida myself. The ocean has a way of soothing you. It has a music all of it own if you listen carefully. It's as if God is really talking to you. Thank you Leslie Gould for another awesome story!! I wish I could give you ten stars!! A Simple Singing, releasing July 31, is the second book in the Sisters of Lancaster County series by Leslie Gould. This is a time slip series, where both a modern day and a historical storyline are presented. It’s a series that shows how the lives of the present day Bachmann sisters are influenced by stories about their ancestors. Marie Bachmann is an obedient Old Order Amish young woman. She’s always been the “good daughter”, something she’s been proud of, though pride is a sin and not the Ami . Marie Bachmann is an obedient Old Order Amish young woman. She’s always been the “good daughter”, something she’s been proud of, though pride is a sin and not the Amish way. When two men, one Mennonite and one Amish, both catch her eye, Marie must discern which path is God’s true plan for her. I really enjoyed Marie’s journey over the course of the story. I feel she had a complete conversion of heart and became a better person by the end. I also enjoyed the visit to Pinecraft. I feel that’s where Marie was given a chance to relax and see things from a different perspective. The story had an easy reading pace. I was really drawn into Marie’s chapters and couldn’t wait to see how things ended up for her. I am happy to have read this book! I recommend it to fans of Amish romances as well as historical fiction fans. The last book in this series, A Faithful Gathering, is due out February 5, 2019 and will focus on the youngest Bachmann sister, Liesel. I’ll definitely be picking up a copy! An excellent story that delves into the differences between the Amish and Mennonite faiths. The protagonist exemplifies our sometime struggles to listen to the Lord's leading when we have our own plans. I love Leslie Gould's honest stories about Amish life. A Simple Singing by Leslie Gould is the second novel in The Sisters of Lancaster County series. It is December of 2013 and Marie just watched her sister, Jessica marry Silas. Marie Bachman is one for the following the rules and fully expects to be courted by a good Amish man, to settle down on a nearby farm and have a large family. When Bishop Jacobs son, Elijah visits from Florida, it seems like providence. Gordon Martin, their farmhand, likes to sing while he works which reminds Marie of her f A Simple Singing by Leslie Gould is the second novel in The Sisters of Lancaster County series. It is December of 2013 and Marie just watched her sister, Jessica marry Silas. Marie Bachman is one for the following the rules and fully expects to be courted by a good Amish man, to settle down on a nearby farm and have a large family. When Bishop Jacobs son, Elijah visits from Florida, it seems like providence. Gordon Martin, their farmhand, likes to sing while he works which reminds Marie of her father who taught her to sing while they worked in the barn. Gordon has a kind nature and a generous heart, but he is a Mennonite. Mrs. Bachman informs Marie that she will be going to Pinecraft, Florida with her Aunt Suz for a vacation. Marie is surprised at how the Englisch, Amish and Mennonite mingle in the community. She enjoys attending services in a church, the opportunity to sing with others, and to spend time with Elijah. Their second week in Pinecraft, Gordon arrives on a mission trip and Marie gets to know him better. While on the trip, Aunt Suz tells Marie the story of their ancestor, Annie Bachmann and the struggles she faced during the Civil War. Back at home, Marie wrestles with her conscience on her life choices. As Aunt Suz finishes telling her the story of Annie, it helps Marie make a decision about her future. A Simple Singing may be the second book in The Sisters of Lancaster County series, but it can be read alone. I thought the novel was well-written with two interesting, interconnected stories. It did take me a little while to get into the book. Once I did, though, I was engaged. I was happy to see the pacing improve (it starts out a little slow). There are smooth transitions as it switches from Marie to Annie. I actually enjoyed Annie’s story more than Marie’s. I found it more captivating and wish it had been a book on its own. Gordon volunteers at homeless shelters in Lancaster County and in Florida. Ms. Gould handles the subject adroitly as she does the issue of slavery in Annie’s timeline. It was lovely to watch Marie grow as an individual throughout the story. The author is a descriptive writer which helps brings the book to life for me because I can visualize the scenes thanks to her writing. Christian themes present in A Simple Singing are prayer, having faith, and the importance of following the path God has laid out for you (not your own). Ms. Gould did her research for the Civil War scenes especially the Battle of Gettysburg. I like how she included President Lincoln’s Gettysburg Address. I found A Simple Singing to be a heartwarming Amish novel and I am eager to read Liesel’s story in A Faithful Gathering. “A SIMPLE SINGING” BY Leslie Gould is the second book in The Sisters of Lancaster County series. A SIMPLE SINGING” is the story of an Amish woman coming to terms with herself and her faith. It’s a story of choices and listening to your heart. “A SIMPLE SIGNING” is the story of Marie Bachmann who has always lived by the Amish rule to the letter and being the “good” daughter. She’s always dreamed of marrying an Amish man well respected in the community with a farm close to her family farm and her Ma “A SIMPLE SINGING” BY Leslie Gould is the second book in The Sisters of Lancaster County series. “A SIMPLE SIGNING” is the story of Marie Bachmann who has always lived by the Amish rule to the letter and being the “good” daughter. She’s always dreamed of marrying an Amish man well respected in the community with a farm close to her family farm and her Mamm and maybe just maybe one that would share her love of singing. Gordon Martin works on her folk’s farm. He’s dependable, hard-working, has a love of his fellow man. Although a good friend, he’s Mennonite not Amish. On the other hand, her Mamm and Bishop Jacobs would love to see her married to the Bishop’s son, Elijah. In hopes that Marie’s influence would settle Elijah’s worldly ways and bring him back to join the church, settle down and take over farming his Daed’s farm, Marie is sent off with her Aenti Suz to Pinecraft, Florida where Elijah just happens to be working. Excited to spend time with Elijah, who she feels is her future spouse, and fearful to leave the farm, leave Marie with a mix of emotions. She finds out that Gordon too will be traveling to Pinecraft during her time there for some mission work. It’s during their journey to Pinecraft that Aenti Suz starts to share the story of one of their Civil War ancestors, Anne Buchmann. It’s through this story that Marie begins to realize that there is more to being faithful than the length of a hemline or following the Amish rule to the letter. She also realizes that servitude and selflessness are also a big part of it. She does a lot of looking at herself and seeing how she has fallen short. It’s while spending time with both Elijah and Gorton that she see the heart of both men. Has all the time she has been francizing about dream life with Elijah been just that a fantasy? What would become of her dream life if it was with a faithful but Mennonite man? I highly recommend “A SIMPLE SINGING”. It can definitely be read as a standalone book. However, if like me, once you see who well it’s written and the wonderful story it tells, you will be definitely be looking not only for the other book in this series and anticipating the next book in the series, but also checking out this author’s other books. A Simple Singing by Leslie Gould is the second offering in The Sisters of Lancaster series and it just might be even better than the first one that I really liked too. It is another wonderfully inspirational book by one of my favorite authors of Amish stories. This particular series follows three Bachmann sisters and A Simple Singing is about Marie. Marie is the 'good' sister, a rule follower--even to the extent of measuring hems and bonnet lengths, the sister with a tad of a judgmental spirit a A Simple Singing by Leslie Gould is the second offering in The Sisters of Lancaster series and it just might be even better than the first one that I really liked too. It is another wonderfully inspirational book by one of my favorite authors of Amish stories. This particular series follows three Bachmann sisters and A Simple Singing is about Marie. Marie is the 'good' sister, a rule follower--even to the extent of measuring hems and bonnet lengths, the sister with a tad of a judgmental spirit and yet one who truly desires to follow God and to understand Him, a young woman who has music in her soul and just wants her dream of a perfect future as an Amish farmwife to come true. Following her journey to love is a treat as the author has added plenty of tension to the story with Marie being presented with two young men who are involved in her life. I love the characters in Gould's stories. She portrays them realistically and the reader is easily drawn into their lives. Another treat with this book is a second story embedded into Marie's and it takes the readers back to the Civil War where readers meet Marie's great-great-great aunt. Annie's story is just as compelling as Marie's and the author does a marvelous job of stopping at just the right point in one story to pick up in the other. Gould gives interesting historical background on the Civil War time period, with a glimpse of the horrors of war and slavery and nursing during that time. Being an RN and grandmother to a young Civil War drummer boy reenactor, I really enjoyed reading Annie's story. Strong themes of family and faith are woven throughout the book as the author portrays vibrant and realistic characters who deal with the nonresistant lifestyle of the Amish, learning what it means to care for those who are suffering and understanding the true meaning of grace, God's grace and love exhibited through individuals serving others. The author has expertly written a captivating story that will remind readers that God is in the hard times of our lives, molding us, making us stronger and we can trust Him to give us the desires of our hearts as we learn to delight in Him alone. When Gordon shows up in Florida to volunteer in a homeless shelter, her life becomes even more complica For years Marie Bachmann thought of herself as the "good" daughter. She was the most loving to their mother, the most dedicated to their Amish way of life. But when a Mennonite farmhand, Gordon Martin, shows interest in her she can't help but be flattered--until her mother sends her off to Florida. While there, Marie begins spending time with bad-boy Eli Jacob, the bishop's son from back home. This is one of the best books I have read in a long time. 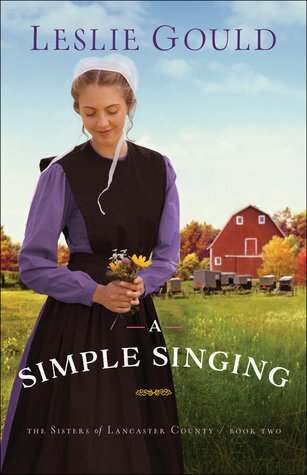 A Simple Singing has two of my favorite types in one book - Amish and the Civil War. When Marie’s aunt begins telling her about her ancestor, Annie, who lived through the Civil War, I was enraptured. Leslie Gould has a flair about her writing that pulls you right in, as if you were Marie yourself. You understand her learning to be more thoughtful of others instead of herself. She was so wrapped up in the rules and regulations of the Amish faith that she forgot about God and what He wanted her to do. There were times you felt she was going to go one way and she ended up going another. You begin pulling for her. Your heart goes out to her to learn a very valuable lesson. Amish and Historical fiction with a dual time line! Why yes, I do love all three, especially when they’re as masterfully combined as they are in this novel. With the authors descriptive storytelling and her strong character development I quickly became caught up in the lives of Marie Bachmann in 2013 and Annie Bachmann in 1863. Marie was difficult for me to like at first because I perceived her to be self-righteous but I soon realized that she wanted what other women her age and in her community Amish and Historical fiction with a dual time line! Why yes, I do love all three, especially when they’re as masterfully combined as they are in this novel. With the authors descriptive storytelling and her strong character development I quickly became caught up in the lives of Marie Bachmann in 2013 and Annie Bachmann in 1863. Marie was difficult for me to like at first because I perceived her to be self-righteous but I soon realized that she wanted what other women her age and in her community wanted which is a husband and family of her own. She had been the perfect Amish daughter, never leaving her family unlike some of her siblings, helping out in her district when needed, but she still hadn’t received the marriage proposal she wanted. I started to like Marie so much more when she went with her Aenti Suz to Pinecraft and learned more about her ancestor, Annie. I loved Annie from the moment I met her and wished that her story had been a stand alone because I loved the time period, her selflessness and her bravery. The author wrote both time lines so that they connected beautifully and I was more than satisfied with both of the protagonists stories and felt they were complete. I want to mention the other element of this book that I liked and that is the Mennonite friends and neighbors we meet in Lancaster County and Pinecraft. There are several secondary characters that were interesting and I enjoyed getting to know them, too. The other thing I can say about this must read book is that it will definitely be on my top ten favorites this year. This was a dual timeline novel with connections on both ends. (Marie 2013 and Annie 1863) They both lived in the same town and the same house but were separated by 150 years. Annie was Marie's great great great aunt and Marie learned a lot not only about Annie but about herself from hearing Annie's story from her Aunt Suz. I didn't warm up to Marie at the beginning. She was self righteous and always pointing out others sins without examining her own life. She was strict Amish through and through This was a dual timeline novel with connections on both ends. (Marie 2013 and Annie 1863) They both lived in the same town and the same house but were separated by 150 years. Annie was Marie's great great great aunt and Marie learned a lot not only about Annie but about herself from hearing Annie's story from her Aunt Suz. I didn't warm up to Marie at the beginning. She was self righteous and always pointing out others sins without examining her own life. She was strict Amish through and through. She had her life planned out which included Elijah, an Amish man that hadn't settled down and joined the church. Her vision was to marry him, be a good wife while he farmed his parent's land. She just hadn't consulted God, one of her downfalls. Annie was living through the Civil War and although Amish, she was called on to leave her home and family and help nurse wounded soldiers. A big step for her and very hard at the beginning. Interestingly they both had expected matches for marriage, and also close male friends from other religions. I loved reading about their thoughts and observing how slowly God was working on their hearts. I enjoyed reading the history included. President Abraham Lincoln giving his Gettysburg address, the skirmishes between the North and South, and bits and pieces about the Underground Railroad. The family ties, the romances and the telling of everyday life all added to the beauty of the story. It will remain with me for a long time. A Simple Singing by Leslie Gould is book two of the Sisters of Lancaster County series. It is a time slip novel where we follow Marie Bachmann’s story in present day Lancaster and her ancestor, Annie which is set in the Civil-War era. Marie thinks of herself as the “good” daughter and always follows the rules, she even plans on marrying a good Amish farmer. When bad-boy, Eli Jacob returns to town, she sees it as an opportunity to have the life she has dreamed about. Gordon Martin, the Mennonite A Simple Singing by Leslie Gould is book two of the Sisters of Lancaster County series. It is a time slip novel where we follow Marie Bachmann’s story in present day Lancaster and her ancestor, Annie which is set in the Civil-War era. Marie thinks of herself as the “good” daughter and always follows the rules, she even plans on marrying a good Amish farmer. When bad-boy, Eli Jacob returns to town, she sees it as an opportunity to have the life she has dreamed about. Gordon Martin, the Mennonite man that has a big heart, has his eyes set on Marie as well. When her mother sends her to Pinecraft to accompany her Aunt Suz, she thinks of it as a opportunity to court Eli and get him to come back home until Gordon shows up on a missionary trip. As Aunt Suz recounts the story of Annie, a heroine of her time, Marie starts to “take a look” at her life. I really enjoyed hearing Annie’s story and how it helped Marie to realize where God was leading her future. Gould did a great job of brining the two stories together while not allowing one to overshadow the other. The characters were well-developed. I gave this book 5 stars and can’t wait to read the next chapter in the Bachmann sisters’ lives. A Simple Singing is the second book in The Sisters of Lancaster County written by Leslie Gould. I enjoyed this story very much and learned a lot by reading it. The story flashes back and forth between present day to the Civil War era. This story moves along at a good pace to keep the reader wanting more. The descriptions the author has given sets you in both time periods. The characters are very likeable and realistic. I could identify with several of the characters but really liked Marie and Ann A Simple Singing is the second book in The Sisters of Lancaster County written by Leslie Gould. I enjoyed this story very much and learned a lot by reading it. The story flashes back and forth between present day to the Civil War era. This story moves along at a good pace to keep the reader wanting more. The descriptions the author has given sets you in both time periods. surprise you the paths they each took to reach their goal. They are both strong, independent, loving young ladies. The characters really told a wonderful story. I was not given a complimentary copy of this book to read and review. I was not approached by anyone to post a favorable review. I have rated this book with five stars because it has met my expectations of a wonderful story that I can highly recommend to others. This second book in the Sisters of Lancaster series can certainly alone. I read the first so long ago I don’t remember much of the story, but it didn’t matter. Marie Bachmann is a strong character, with whom I could identify. She follows the rules and tries to keep others in line too. Yet she longs to marry Elijah, the bishop’s wayward son. She plans to stay Amish, unlike her sister and some others she knows. Could her family’s Mennonite farmhand, Gordon, change her mind? Marie accompanies her m This second book in the Sisters of Lancaster series can certainly alone. I read the first so long ago I don’t remember much of the story, but it didn’t matter. Marie Bachmann is a strong character, with whom I could identify. She follows the rules and tries to keep others in line too. Yet she longs to marry Elijah, the bishop’s wayward son. She plans to stay Amish, unlike her sister and some others she knows. Could her family’s Mennonite farmhand, Gordon, change her mind? Marie accompanies her maiden aunt to Pinecraft, Florida, where life is more liberal than their home community in Lancaster. Gordon goes there to help in a homeless shelter, and Elijah works at a bakery there. Will the two men be in competition regarding Marie? Music also plays a role in the story. Marie enjoys singings and is drawn to music in a way Amish should not take part. Can she reconcile the different pulls on her life and make wise choices? What is God’s will for her future? Interwoven in this contemporary tale is the story of Marie’s ancestors during the Civil War. We even get a glimpse of President Lincoln giving his Gettysburg Address. I enjoyed the thought-provoking novel and its insights into the past along with witnessing well-developed characters work through their struggles. I received a copy from the author. All opinions are my own. I would give this book 4.5 stars if I could. The depth of personal reflection and evaluation on the part of the main character were outstanding. The author writes the characters thoughts and feelings, struggles and victories, and inward transformation in such a way that makes you want to evaluate yourself. It’s genuine and real. The stream of thoughts throughout the book are so cohesive and well written. Loved the redemption, forgiveness, grace and mercy. Loved the transformation from legalism t I would give this book 4.5 stars if I could. The depth of personal reflection and evaluation on the part of the main character were outstanding. The author writes the characters thoughts and feelings, struggles and victories, and inward transformation in such a way that makes you want to evaluate yourself. It’s genuine and real. The stream of thoughts throughout the book are so cohesive and well written. Loved the redemption, forgiveness, grace and mercy. Loved the transformation from legalism to grace. I could really relate to this being brought up in a legalistic church culture. The author described it so well without sounding preachy. And the transformation in the heart of Marie was great. I questioned the necessity of the time hop story of Annie. It just seemed like it should have been tied in better. I felt like it was a little forced. Both stories were well written I just didn’t particularly like how it was “oh let me tell you this story” all of a sudden. Other than that this was an excellent book. I loved it. Dual-time stories have become my favorite kind of stories to read! I was first introduced to dual-time stories in Leslie Gould's writing. Her most recent novel, A Simple Singing, is a beautifully written dual-time story. Marie Bachmann has grown up always following the rules in her Amish Community. One day she will make an Amish man the perfect wife. After her Aunt shares with her a story about one of her ancestors that lived during the Civil War, things change, and Marie's future isn't as clear Dual-time stories have become my favorite kind of stories to read! I was first introduced to dual-time stories in Leslie Gould's writing. Her most recent novel, A Simple Singing, is a beautifully written dual-time story. Marie Bachmann has grown up always following the rules in her Amish Community. One day she will make an Amish man the perfect wife. After her Aunt shares with her a story about one of her ancestors that lived during the Civil War, things change, and Marie's future isn't as clear anymore. Author Leslie Gould weaves a beautiful masterpiece in this story. There is much research that went into this fascinating novel. The characters experience circumstances that we can all relate to including grief, self-reflection, empathy, faith and love. A definite must-read! I voluntarily reviewed a copy of this book from the author and publisher and have given my honest opinion. A Simple Singing is book two in The Sisters of Lancaster County series by Leslie Gould. This is a great story from beginning to the end. It is almost like reading two stories in one. You cant wait to find out what happened in each one. It is like a time story, both where we follow ancestors and the modern day time. We read about slavery, and the homeless in this story. We have both the Amish and the Mennonites. I enjoyed learning more about the Mennonites. A young woman who has always been good and she has her life already mapped out like she thinks it will go. Does things always go the way we plan? I enjoyed A Simple Singing and cannot wait for book three in this series. When Leslie Gould writes a story about the Amish, she delivers so much more than a captivating tale. In addition to giving the reader likeable characters caught up in interesting plot lines, she engages our minds. In this book, I learned distinctions between Amish and Mennonite communities and was challenged to consider contemporary issues such as immigration in light of past issues such as the Civil War. Gould's main character was forced to recognize her own prideful religious legalism juxtapos When Leslie Gould writes a story about the Amish, she delivers so much more than a captivating tale. In addition to giving the reader likeable characters caught up in interesting plot lines, she engages our minds. In this book, I learned distinctions between Amish and Mennonite communities and was challenged to consider contemporary issues such as immigration in light of past issues such as the Civil War. Gould's main character was forced to recognize her own prideful religious legalism juxtaposed against her friend's Christlike love as worked out in Christian service...her judgmental attitudes versus his mercy. I liked this book a lot and recommend it wholeheartedly. There are some of the typical elements in an Amish romance -- a young Amish girl struggling with her feelings about more than one young man and how to make a decision that might involve her leaving the church. But this story is much more complex than that, including a story from Marie's family's past that may be of great help in her deciding what direction her future should A Simple Singing, the second book in Leslie Gould's Sisters of Lancaster County series, is another really good Amish story. I so enjoyed this sweet story of Miriam’s journey to love and faith. Leslie Gould has written a compelling story of how God can use disappointing circumstances to draw us to Himself and reveal things about our own character that we may never have seen before. This is a “split time” story shared with Annie, a young woman who also struggled with difficult circumstances caused by the Civil War. As Miriam learns more of Annie’s story, she begins to look at herself, her Amish life, and her beliefs in I so enjoyed this sweet story of Miriam’s journey to love and faith. Leslie Gould has written a compelling story of how God can use disappointing circumstances to draw us to Himself and reveal things about our own character that we may never have seen before. This is a “split time” story shared with Annie, a young woman who also struggled with difficult circumstances caused by the Civil War. As Miriam learns more of Annie’s story, she begins to look at herself, her Amish life, and her beliefs in a new way. This is another great book by Leslie Gould. A Simple Singing by Author Leslie Could is an awesome book. I probably could not write one word that someone else hasn't already written, so I will try to explain what this book means to me. This plot is intense with superb writing. I was awed by the characters seeming so real and how the author makes the transition between era's without you feeling anything was lost of any part of the book. To me, this is by far one of this author's greatest books. A Simple Singing is Book Two in The Sisters of A Simple Singing by Author Leslie Could is an awesome book. I probably could not write one word that someone else hasn't already written, so I will try to explain what this book means to me. This plot is intense with superb writing. I was awed by the characters seeming so real and how the author makes the transition between era's without you feeling anything was lost of any part of the book. To me, this is by far one of this author's greatest books. A Simple Singing is Book Two in The Sisters of Lancaster County series. I encourage you to read this novel. I really did enjoy reading this second book in the Sister of Lancaster County. This book focused on the middle daughter Marie, and featured two stories. One is current, and the other is during the Civil War. I love history so this was definitely a plus for me. I love the writing style of Ms. Gould as well. I just wish there was just a bit more romance. Overall, this is a wonderful story and I highly recommend to all Amish fiction readers. *I was given a copy of this book by the publisher, and was I really did enjoy reading this second book in the Sister of Lancaster County. This book focused on the middle daughter Marie, and featured two stories. One is current, and the other is during the Civil War. I love history so this was definitely a plus for me. I love the writing style of Ms. Gould as well. I just wish there was just a bit more romance. Overall, this is a wonderful story and I highly recommend to all Amish fiction readers. Two stories intertwined finding love and life in today and in the civil war era. Marie, the perfect Amish daughter, following everything to the ordinance, unhappy even though she does have a suitor. He follows her to Florida, and now enters another suitor. With her aunt telling of life in the civil war, slavery, Lincoln,and how life was. It spans from, Marie at 2013 to Anne in 1863, being in the same house. A touch of love, history, and decisions, will she have made when she returns. Given ARC by Two stories intertwined finding love and life in today and in the civil war era.